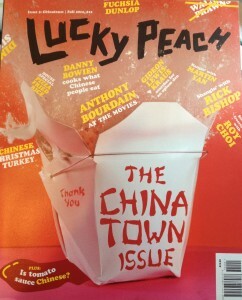 Very happy to be in the Chinatown issue of Lucky Peach, which is out now! It’s a fantastic issue, packed with interesting stuff. Londoners can find it in Foyles in Charing Cross Road. I was agog at this awesome issue (ordered from Amazon.com to my London flat). Loved your article enlightening us about those segregated menus in London’s Chinatown (and those elsewhere, too). I’m Chinese but assumed the Chinese-language section was a smug hoarding of the best stuff for our own kind. Really frustrating and shocking to read that it’s only to protect the proporietors from accusations of inferior meat and “improper” cooking (e.g. rose-pink chicken at the bone; fatty pork). There is probably much less of that going on now, not least because of your stern, well-educated whack up the Western world’s backside with a pair of chopsticks! I am so delighted to have discovered your blog. My chef sister gave a copy of your “Shark’s Fin and Sichuan Pepper” book to me, and I was instantly mesmerized by your adventures, zeal and courage in this incredible accomplishment. My only disappointment is that you are not living here in the USA so that we lesser achievers might follow in your footsteps in culinary adventures and tastings in all things Chinese. I would like to recommend an Oriental food blog to you for your enjoyment. It is the creation of a husband and wife team who are great enthusiasts of Chinese food, especially. It is very well written with wonderful photos and with great enthusiasm. It covers the San Diego area with side trips globally. I’ve just ordered “Every Grain of Rice,” and I await it’s arrival. @Jamie: The segregated menus to which Fuchsia Dunlop referred in her Lucky Peach article are global. Certainly they are not in every Chinese restaurant, but not every restaurant that uses them will admit to it. Here in Albuquerque we have one restaurant where you have to know to ask for the “blue menu” and another where you have to pass a verbal quiz about textures and flavors in which you are willing to partake. PS: Dear Fuchsia Dunlop, Keep up the good work! We enjoy cooking our way through your books repeatedly!